Kate thought she and her family were making a fresh start in her husband’s hometown, but she quickly learns that small towns can hold big secrets. When her first client is poisoned just after Kate leaves her mansion, she knows she’s gotten off to a bad start. But things only get worse when the police find Kate’s fingerprints on the murder weapon, suddenly putting her in the position of suspect number one. The stopwatch is ticking for Kate to prove she had nothing to do with the murder, and the odds are further stacked against her when items stolen from the Nethercutt mansion start showing up in the McKenzie home. Now, Kate must trust her methodical skills and expert eye to sort out who is trying to frame her and to find the real killer before she’s organized right into a jail cell. It’s been a while since I’ve read a cozy, and this books was a perfect choice. It’s a great murder mystery that will keep you guessing since there are so many different people that could have done it. All the characters are well developed, but aren’t your everyday cookie cutter type, they have their own quirks and flaws. I loved that Kate was happily married since most cozy sleuths are single. She also had twins, and that is unusual too. I loved the relationship between her and her family, and between her and Meg. There were plenty of twists and laughs, and lots of situations that had me thinking I knew what was going on. But then I’d be thrown for another loop, and I’d have to start over trying to figure out whodunnit. Another thing I loved were all the organization tips throughout the book. They all seemed very easy to do, and would solve a lot of problems for your household. This book had so many unusual aspects to it that it is by far one of my very favorite cozies, and I can’t wait for the rest in the series. 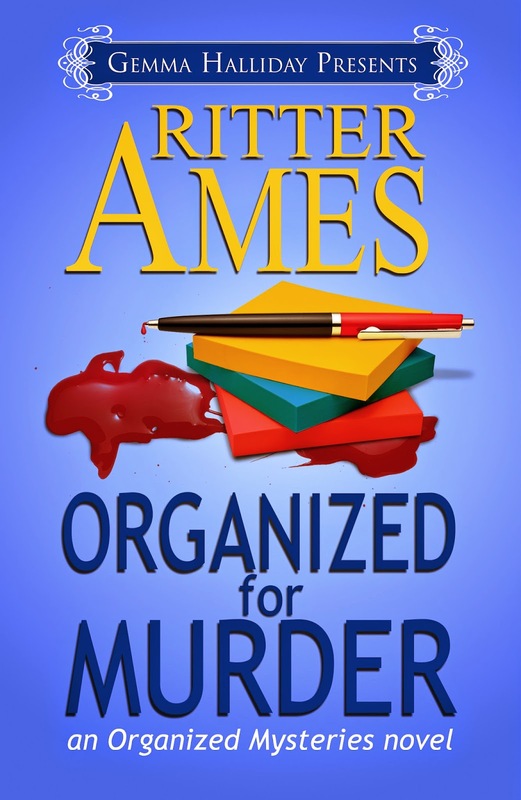 Ritter Ames hit the ball out of the park with this book and I’d have no problem recommending it to anyone who loves a good mystery. Even if they aren’t a cozy lover, I think they will be after reading this fantastic book! Can’t be bad if it’s about an organizer lover !, send it my way please!! I’m sorry I missed the giveaway contest – I’d love to read this book! Good review, BTW; your description of the ways in which the heroine is unique or unusual definitely appealed to me.